Artisanal miners - Actividad minera tradicional en el río Sucio, cerca del barrio Jabalí. Municipio Santo Domingo, Departamento de Chontales. Mineros artesanales de Nicaragua se oponen a la minería a gran escala de la empresa canadiense B2Gold. Ever since the Nicaraguan government declared its interest in 2001 to facilitate the development of mining projects, the number of Canadian investors in the Nicaraguan mining sector has increased. One of these investors is B2Gold, that has invested more than a 100 million dollars in exploration and exploitation activities since 2007. In the year 2009 B2gold acquired a 100% interest in the open pit gold mine of La Libertad and subsequently invested heavily in exploration and expansion of the mine. In 2010, B2Gold discovered the The Jabalí vein, which is located just south of the town of Santo Domingo, a traditional artisanal mining town since 1870. Since the arrival of B2Gold, the artisanal miners have seen their sources of income severely affected. In addition, the community of Santo Domingo criticised the deforestation of a hill without the realization of an EIA and showed preoccupation regarding threats of contamination of local water bodies, as well as the frequent use of the National Police and judicial authorities to protect the foreign investment. For example, the Mico´s river is known for high concentrations of pollutants and that affects not only the residents of La Libertad, but also have impacts on the communities and animal´s health downstream in Bluefields. Hundreds of artisanal miners as well as different communities affected by mining in Nicaragua have been protesting against the further expansion of B2Gold and demanded that the company halts its plans to develop a new mining area near its La Libertad and Santo Domingo operations that would jeopardize artisanal mining and could have a damaging effect on the environment. 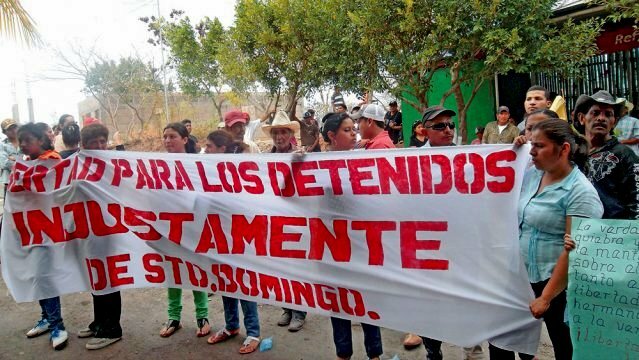 In August 2014, during the 1st International Mining Congress in Managua, the communities organised a environmental walk to express their concerns about the negative impacts of mining. However, several measures were taken by government officials to prevent the anti large-scale mining mobilization from entering into the city. During other manifestations artisanal miners have been arrested without cause. Paradoxically , Daniel Ortega's last governments have shown opposition to the mining project Crucitas, in Costa Rica, due to the threat to the river San Juan . 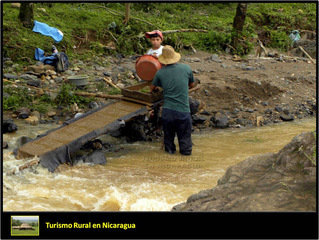 However , this concern for the environment are not reflected in Nicaragua. Project Details -In 2011 the company reported the extraction of 140 thousand troy ounces of gold in two different projects: El Limón (in the Department of León) and La Libertad (in the department of Chontales). -B2Gold expects to extract between 150 000 oz and 160 000 oz of gold per year, at a cash cost of about $590/oz to $625/oz. In comparison, the artisanal miners extract around 2400 oz per year. -Double standard applied by Nicaragua - complaining against Costa Rica gold mining projects but not doing anything in Nicaragua against pollution of Mico River. Why? Explain briefly. B2gold has obtained permission to exploit the Jabali vein in La Libertad affecting the income of the Santo Domingo community and the environment. Finally, the government of Nicaragua is violating the right of protest to the Nicaraguan people. Documented reports of pollution of the river Mico and affectation to the people of the river bank , have failed to stop the project. Observatorio de Conflictos Mineros de America Latina OCMAL. Ceicom, Ficha de Registro Impactos Negativos de la mineria en Nicaragua. Artisanal miners Actividad minera tradicional en el río Sucio, cerca del barrio Jabalí. Municipio Santo Domingo, Departamento de Chontales.